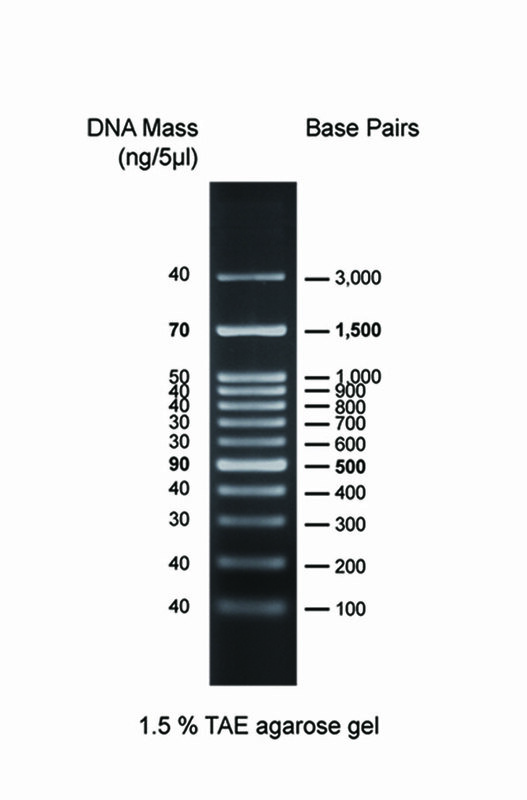 The AccuRuler 100 bp Plus DNA RTU Ladder is suitable for sizing linear double-stranded DNA fragments from 100 bp to 3,000 bp. The 500 bp and 1,500 bp bands have increased intensity to provide internal orientation. quantification in comparably intense samples of similar size. Online Shopping, Free Worldwide Shipping! Source PCR products and double-stranded DNA digested with appropriate restriction enzymes, are phenol extracted and equilibrated to 10 mM Tris-HCl (pH 8.0) and 1mM EDTA. Storage and loading buffer: 10 mM Tris-HCl (pH 8), 10 mM EDTA, orange G, xylene cyanol FF and glycerol.